It is not exotic, or scenic, but Browning Lake can be just as fun when there are fish to be caught. This is a small lake set up to cater anglers who are still at the learning stage or simply want to wet a line on the way home from a hiking day trip. Access to Browning Lake is as easy as it can get. Located just south of Squamish, Browning Lake is part of Murrin Provincial Park, right next to the busy Sea to Sky Highway (Highway 99). There is sufficient amount of parking space and public washrooms are on site. The shoreline has many access points, which are suitable for youngsters and elderlies. 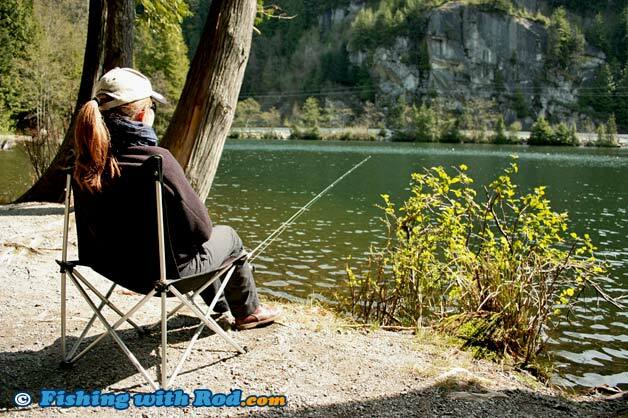 There isn't a particular "best", or most productive spot at Browning Lake, but it is best to fish on the west side of the lake so you are not sitting right beside the Sea to Sky Highway. Browning Lake is quite often frozen during the winter months, otherwise it is fishable year-round. It is stocked with rainbow trout by the Fraser Valley Trout Hatchery several times per year, usually between April and June. Fishing is best when it coincides with stocking times and when insect activities are high. Shore fishing is your best option at Browning Lake. Because it is a rather busy park during days when the weather is good, this is not an ideal lake for flyfishing. If recreational usage is low, wading into the water on the western side of the lake may allow you to wet a fly. Typical leech patterns, in sizes 10 to 14, would work well when stripped slowly. One can also use a small boat or float tube if flyfishing is the preferred method. With a spinning rod, you number of options grows. Most anglers prefer to float fish by casting as far as they could. Watch for surface activities. Sometimes rainbow trout are found close to shore, especially in the evenings. Resting a baited bottom rig on the lake bed is also effective and relaxing. The lake is rather deep so on sunny days, they can be resting right on the bottom than being active near the surface. Be sure to bring a rod holder to avoid damaging or losing your rod to a fish. Bait such as deli shrimp, dew worm, roe, single eggs work best. Browning Lake is located in Region 2 in the British Columbia freshwater fishing regulations. Browning Lake is located inside Murrin Provincial park, where many other recreational users can be found. Please respect other users in the area. Keeping the noise level down and picking up your own garbage makes everyone's experience enjoyable.